Once in a blue moon, you’ll tune in to a new episode of your favorite television series, only to find that hardly any recognizable characters are present. Instead, the episode is focused on a slew of strangers connected tangentially, if at all, to the established players. These newbies spend the episode fostering their own lives, relationships, problems, and plot contrivances in a brand new setting. It almost feels like a completely separate television show… because, in fact, it is. Or at least it hopes to be. Occasionally, the men and women behind the curtain of a given television network will sneak a de facto pilot into a popular existing program, testing the premise on a guaranteed audience. Some of these endeavors, known as “backdoor pilots,” come to fruition and spawn full series, such as Mork & Mindy (which started with a Season 5 episode of Happy Days) and Maude (from a Season 2 episode of All in the Family). But many spawn nothing, remaining forever bizarre and awkward departures from the series that housed them. Here are a few backdoor pilots that fall into the latter, more regrettable camp. A favorite example among television historians came in the Season 5 episode of the hit sitcom The Brady Bunch. Mega-producer Sherwood Schwartz, who along with the blended family classic created Gilligan’s Island, wanted to develop a show that celebrated racial diversity. As such, he introduced the Bradys to Ken and Kathy Kelly, a white American married couple and new adoptive parents to three young boys: one white, one black, and one Asian American. Despite Schwartz’s ostensible influence over network television audiences, the “Kelly’s Kids” episode did not beget its own show. The Nanny committed a much more egregious instance in its second season, stepping away from the Sheffield household almost entirely to lend focus to the quirky staff members of a local beauty salon called the Chatterbox (for which the episode was named). The dynamics were largely in step with that of The Nanny, promising romance between a busybody female lead and her uptight male employer and single father. Smack dab in the middle of Rory Gilmore’s most divisive relationship, Gilmore Girls took a quick jaunt out of Stars Hollow, Connecticut, down to a corner of Southern California torn straight from William Asher’s Beach Party movies. The Season 3 episode “Here Comes the Son” united Jess Mariano with his deadbeat dad and hippie stepmom in an experiment dubbed Windward Circle, which The WB hoped would be a warm modern family dramedy in the vein of Gilmore Girls itself. But seeing as Jess wasn't exactly a favorite for many Gilmore Girls fans, his spin-off never came to fruition. A short while later, The WB took another stab at the maneuver on Smallville, introducing DC Comics’s well-known Aquaman character in the superhero series’ Season 5 episode “Aqua.” The effort seemed mostly bent on piquing general interest in the character, as the network would recast its Aquaman (replacing Alan Ritchson with Justin Hartley) during development of his proper series Mercy Reef. Unsurprisingly, nothing came of the show, leading Smallville to revisit Ritchson’s Aquaman character in later seasons. Smallville was hardly the first superhero series to mine its comic book history for potential spin-off fodder. The Marvel Comics-based drama series The Incredible Hulk, starring Bill Bixby and Lou Ferrigno, gave the likes of Thor and Daredevil a whirl in its late ’80s TV movies The Incredible Hulk Returns and The Trial of the Incredible Hulk. Neither hero got his spotlight back then, but time certainly did make it up to each of them. Late in its second season, Gossip Girl leapt back in time to the 1980s for a self-contained story about young Lily’s (played in flashbacks by Brittany Snow) misadventures in Los Angeles with her sister, played by Krysten Ritter. While the episode received a relatively positive reception, The CW opted not to bring Valley Girls to life as its own series—this despite announcements to the contrary made before the Gossip Girls episode even aired. Though the series finale of The Office was only a few weeks away, NBC was still unready to throw in the towel on its esteemed mockumentary sitcom. The network tasked Paul Lieberstein, who at the time was the show runner of The Office, with developing a test pilot for Rainn Wilson’s popular character Dwight Schrute. 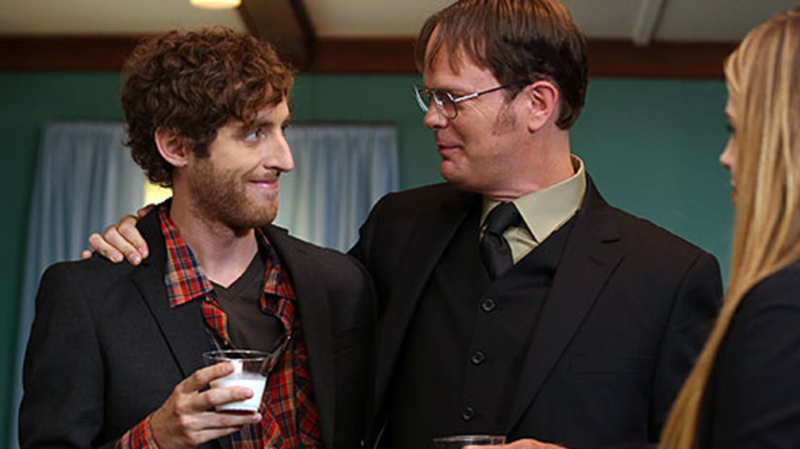 The ninth season episode “The Farm” focused on Dwight’s life outside of Dunder Mifflin: It reunited him with his marijuana farmer brother and relatively normal sister and introduced a new love interest in a local farm girl. Ultimately, the series was scrapped, allowing Dwight to find true love with his on-again-off-again romantic partner Angela in the Office finale. In the late Season 1 episode “Mr. Quiet,” The Cosby Show couriered viewers to an activity center under the pretense of a lecture to be delivered by Cliff. The Huxtables were shuffled to the background, however, in favor of guest star Tony Orlando and his fellow center staff members, the lot of whom were actually spotlighted in end credits title cards (as if the message wouldn’t have been subtle enough otherwise). Charmed producers insist that the supersized Season 5 premiere “A Witch’s Tail” wasn't originally meant to be a backdoor pilot, but it sparked an attempt at a series about a mermaid (“Mylie” in the episode, “Nikki” in later development) existing among mortals and contending with supernatural forces much in the way the Charmed sisters did. The Scott Baio sitcom with the impossibly catchy theme song actually spent much of its final season trying to launch new series for its central cast members, but with one catch to make the whole ordeal feel even more bizarre: The actors were tasked with playing identical relatives of their established characters. In the 19th episode of Season 5, “Lost Resort,” Charles in Charge star Willie Aames played an hotelier in Hawaii, and the lookalike cousin to his regular character Buddy. Four episodes later, in “Almost Family,” Ellen Travolta played her own twin sister Sally, a car wash proprietor. Finally, in the penultimate episode of the series, “Fair Exchange,” Nicole Eggert doubled down as an identical cousin living in New Mexico with her family and a foreign exchange student. None of these went to series. Yet another multiple offender, The Facts of Life made three attempts at launching series for new characters: the Season 2 finale “Brian and Sylvia,” about Tootie’s aunt and uncle, an interracial couple; the Season 3 episode “The Academy,” about a nearby all boys school; and the Season 3 episode “Jo’s Cousin,” which focused on the 14-year-old only girl in a family of machismo-imbued New Jersey men. The premise of the episode, and the show it was meant to yield, surrounded teenaged Amanda’s experiences at a boarding school for maladjusted witches. Sabrina joined Amanda on her initial visit to the academy, but acted mostly as a vehicle to introduce the audience to new characters like Professor James Hexton, played by Charles Shaughnessey, and a talking dog named Phil, voiced by Blake Clark. Nothing became of the Witchright Hall idea, but both Hart and Clark did reprise their roles in later episodes. Now known best for her role on Silver Spoons, Erin Gray was almost the star of her own action/crime series, thanks to a friendly nudge from a first season episode of Magnum, P.I. Named for her character, the “J. ‘Digger’ Doyle” episode introduced Gray as a security expert called upon to assist Magnum in the prevention of an assassination attempt on the unseen character Robin Masters, voiced by Orson Welles. An episode in the first season of Star Trek: The Original Series devoted to the 1968 adventures of terrestrial super spies played by Robert Lansing and Teri Garr went so far as to promise more “interesting experiences in store” for its two guest characters, as professed forebodingly by Mr. Spock in the episode’s final moments. As certain a proclamation of intended spin-off as this might have been, Star Trek was unable to make a proper series stick for Lansing and Garr’s respective characters, Gary Seven and Roberta Lincoln. Of the 797 episodes to broadcast under the Doctor Who umbrella, spanning 26 seasons between 1963 and 1989 and nine serials since 2005 (not to mention a TV movie back in 1996), only one has been absent of both the Doctor and his contemporaneous companion. That episode was “Mission to the Unknown,” which aired as part of the original incarnation’s third season. In lieu of the Doctor’s continuing misadventures, the episode focuses on an impending conflict between planet Earth and the imperialistic alien race, the Daleks. Characters included Earthling military officials, Dalek conquistadors, and a variety of new alien species. The hope was to warm audiences to the idea of such complex interplanetary struggles in advance of a space opera series on the subject. Ultimately, the Daleks remained confined to the Doctor Who margins.